The War of the First Coalition between Revolutionary France and most of the rest of Europe came to a close in April 1797 when Austria requested an armistice. Facing a series of defeats, most notably the loss of the strategically-vital fortress of Mantova, the Austrians could not stop Napoleon Bonaparte’s armies from marching into the Habsburg heartlands. The armistice eventually led to the Treaty of Campo Formio, finalized in October 1797. France gained massive swathes of territory including the Austrian Netherlands and everything on the left bank of the river Rhine. To sweeten this for the Austrians (and by extension the German princes of Holy Roman Empire), the French team put forward the idea of territorial compensation. Select princes and others dispossessed of lands that passed under French rule would receive others in exchange, chiefly at the expense of weaker states and particularly the seemingly-countless sovereign ecclesiastical entities, the bishoprics, abbeys and others that held status of semi-independent states within the Holy Roman Empire, the landed knights, the Imperial cities, and the principalities too small to defend themselves from despoliation. 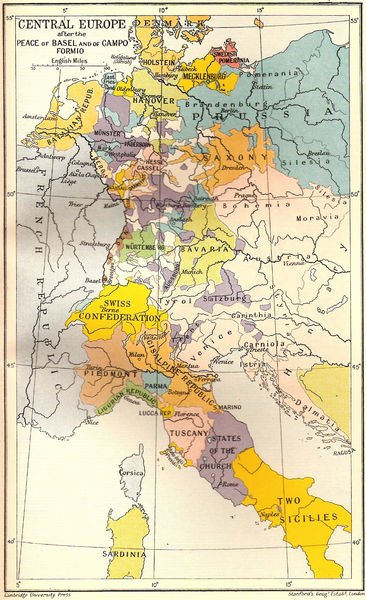 The treaty itself only made one such exchange openly; the Austrians gave up the Netherlands (most of present-day Belgium and Luxembourg) and partitioned the Republic of Venice with France; the Venetian Terra Firma (mainland Venice) including the city herself, Istria and Dalmatia went to Austria while the French took Corfu and the Ionian Islands. The Republic of Venice had not even been a party to the war, but still deeper cynicism and greed would follow. The treaty provided for a congress to be called to determine just compensation for those rulers dispossessed by the French annexations. Meetings began in Rastatt the following month, with ten delegations representing the major states of the Holy Roman Empire (including Austria and Prussia) and the Teutonic Order, plus France. The smaller states sent their own observers, and often their princes, to monitor the discussions and lobby for their own interests. The official talks proceeded very slowly, as not only territory had to be assigned but cash indemnities determined and paid to compensate for all manner of lost feudal privileges, from sheep-shearing rights to river tolls. Dinners, balls and parties dominated the gathering, as did day trips to the nearby resort of Baden-Baden. Observers then, and some historians later, derided the delegates for spending their time on such frivolities; the austere French contingent, which didn’t even wear powdered wigs, took no part in the entertainments. But the real work of the congress took place here, away from the formal meetings. 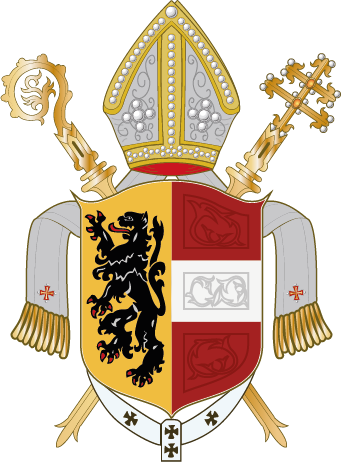 The Congress gave the German secular states the opportunity to finally break the worldly political power of the Roman Catholic Church, under cover of a peace agreement. This also suited the French revolutionaries’ ideological opposition to a religious role in government (and to the very existence of organized religion). The church, of course, fought back against this idea as best it could, pointing out that Protestant rulers would gain a great deal while Protestant churches would sacrifice very little. The feeding frenzy brought additional territory and inhabitants to all of the secular states, but Austria for the most part remained aloof. Tirol snatched the bishoprics of Brixen and Trent, which held property interwoven throughout the province, but the Austrians allowed other choice bordering pieces like the bishoprics of Passau and Konstanz to be gobbled up by Bavaria and Baden, respectively. Never has there been a more glorious bargaining chip. Francis II, through his representative Franz Georg von Metternich (father of the future Austrian Chancellor Clemens von Metternich, who went to Rastatt as his assistant), apparently played for a bigger prize: all of Bavaria. The Habsburgs had long coveted Bavaria, and attempts to prize it loose from the Wittelsbach family had taken place during the War of the Austrian Succession, and again in efforts at swapping Bavaria for other territories in 1776 and 1785. With thousands of square kilometers and millions of inhabitants changing allegiance, the time seemed ripe to finally round off the dynasty’s German-speaking lands. That wouldn’t happen: France declared war on Austria and Russia in March 1799, with the Holy Roman Empire taking the side of the Austrians with an enthusiasm not seen in centuries. The Congress suspended its meetings, and two of the three French delegates were murdered while on their way home – just who ordered their killing remains unclear. The war went badly for the Allies, and in February 1801 Austria and France reached a new peace accord, in which France received Tuscany in Italy and its Grand Duke Ferdinand III, Francis II’s younger brother, became Grand Duke of Salzburg. With peace returned, the Rastatt Congress resumed its deliberations, this time without Austrian participation. An agreement was finally hammered out in February 1803 and ratified by Francis II two months later. This Hauptschluss (formally, the Reichsdeputationshauptschluss) radically re-organized the Holy Roman Empire. Forty-five of the 51 Imperial cities lost their independent status, as well as three electorates, 19 prince-bishoprics and 44 independent abbeys. The three large south German states, Baden, Württemberg and Bavaria, proved the big winners, helped by Austria’s failure to participate in the second round. Max Franz, the Archbishop-Elector of Cologne and uncle of Holy Roman Emperor Francis II (but probably better known for discovering musical prodigy Ludwig van Beethoven), believed that the territorial adjustments did not go far enough. The middle-sized states that resulted still could not stand up to the French, but now had become large enough to negotiate on their own and potentially become satellites of Paris. Instead, he suggested a “Polish solution” – the Empire should be divided between Austria and Prussia, thus forming two powerful states each able to defend their territories from French encroachment and, implicitly, drive the revolutionaries out of the German territories they now occupied on the left bank of the Rhine. The Elector, living in exile in Vienna, apparently did little to press his idea; he had become extremely fat after being kicked out of Cologne and died in July 1801, before the Rastatt Conference resumed its work. His successor, his nephew Archduke Anton of Austria, does not appear to have picked up the concept and quietly accepted his much-reduced circumstances, losing the last of his territories in 1803 when the Hauptschluss took effect. To reflect the Elector’s “Polish Solution” in Soldier Emperor, we make a few changes to the initial situation for the 1804 scenarios. Mecklenburg, Hannover and Kleves begin the game as Prussian home provinces. Baden, Bayern, Hessen and Saxony begin the game as Austrian home provinces (therefore they do not count as conquered areas for victory purposes). Add the Hannover army to the Prussian force pool and the Bayern and Saxony armies to the Austrian force pool; these are treated as Prussian and Austrian pieces for all game purposes. In the 1803 scenario and 1803 campaign game, add one army to the initial Prussian forces and two armies to the initial Austrian forces. These are drawn randomly just like the other armies (any of which may be a formerly German army, depending on the luck of the draw). Add Wrede to the pool of available Austrian leaders in both scenarios; he’s treated as an Austrian leader for all game purposes. While there are no changes to victory conditions, note that this does yield a sizeable advantage to Austria and even more to Prussia. 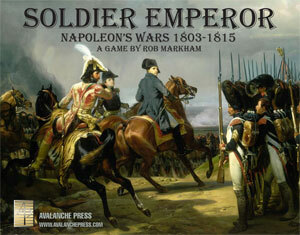 Click here to order Soldier Emperor!